On Friday while Sonya's brother was at camp, the girls and I went grocery shopping. 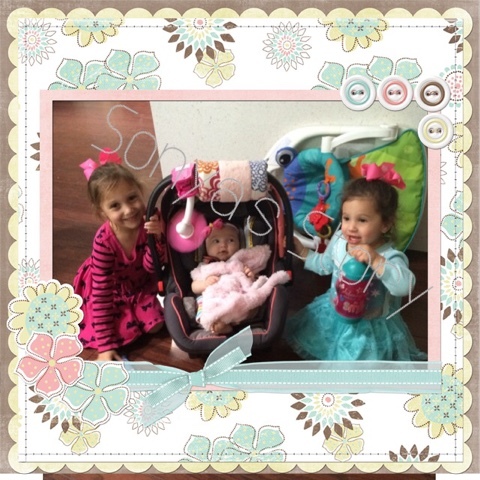 I had Sonya in the baby ktan and her sisters were in the cozy coupe shopping cart. We made it a solid 15 minutes before Sonya started screaming and the girls began invading each other's territories with their limbs causing one or both to whine continuously until I threatened to remove one and make her walk. By the time I made it to the checkout counter I had already lost what little patience I began with and had dialed Sam twice (he luckily did not answer) to tell him with screaming baby in full force, this is the exact reason I do not like to go grocery shopping. I pushed my cart into the line behind another mom who's children were also in the cozy coupe. She of course turned around and gave me a pity smile (yes Sonya was still screaming), saw the girls, and matter of factly said "oh do you have your hands full"..."I remember those days". I did my typical smirk and shrug response to that statement, but gave Sonya a quick kiss on the head and thought to myself "if only you knew". Normally little statements like these do not bother me, but lately when someone says something "innocent" it holds a deeper meaning. Truth be told if I had only had Sonya with me she wouldn't have said it. Does that mean a mom with one child doesn't have her hands full? They are just words, just a social nicety. I know this woman meant nothing by her words other than to acknowlege "hey, we have all been there, we've all had the screaming kiddo and this too shall pass". Similar to the kind grandma and older man that Sam and I encountered on two separate occasions stating that we should enjoy the moments now because in a blink the kids will be 18 and moving out of the house...if only they knew. Having Sonya has definitely made me more aware of others in regards to giving that extra thought before I speak. It is not to say I walk on eggshells before I say something, but I try and be extra sensitive to others situations. Nothing stings more than asking a mom when she'll have more kids when she is secretly battling secondary infertility. Or asking a mom how many kids she has when she has just buried one. These are both examples where unless you know these people on another level you wouldn't be privy to their struggles. Sam and I like to pull the positives, we like to embrace the good times. 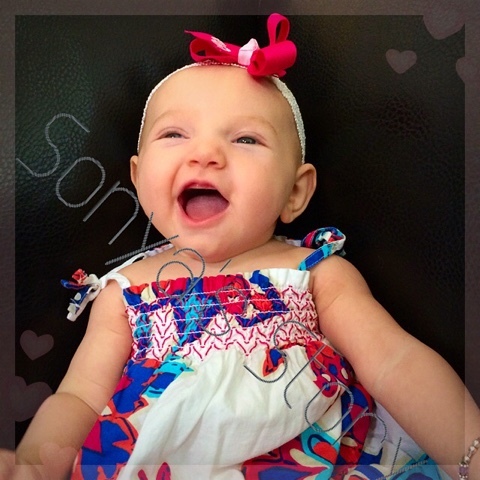 We like to "brag" about Sonya's accomplishments because she is doing amazing. 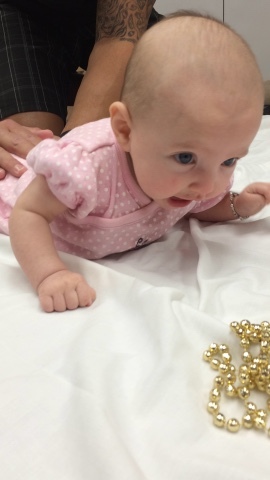 I don't like to write about her seizure activity or what she is not able to do. I do not fault those who say the "innocent" phrases, I know looking at Sonya gives a false sense of "normal". I guess that's what makes it sting more. The assumption that "maybe the doctors got it wrong" or "maybe it won't be as bad as you think". But, no they didn't, and yes it will be. Today, similar to other days I found myself staring at other mothers and/or fathers with a baby who appears to be around 4-6 months old. I gave a quick smile and then thought, "I wonder what it would be like for Sonya to have been born with no CDKL5 mutation". I wonder what it must be like to not have to stress about her having a seizure because her little body overheated simply getting out of the car and going into the mall. I wonder why I took for granted how easy and natural it was for my other three kiddos to hold up their heads on their own. According to Wikipedia, "wonder is an emotion comparable to surprise that people feel when perceiving something rare or unexpected". How ironic that it's me perceiving something "rare or unexpected" in watching a typically developing baby rest on his/her parent. I can only assume from the outside looking in there are those who look at our family from afar and might wonder what it is like to have four "healthy" children. 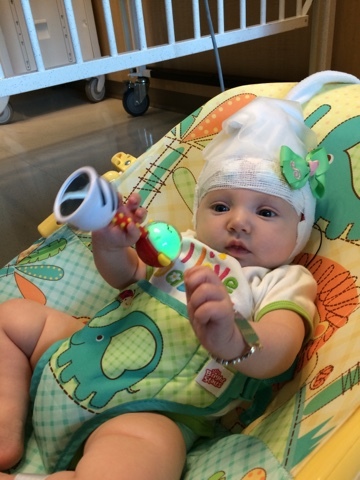 After all, Sonya is still in her infant seat and looks like any other typical baby. The average person who has not come across Sonya's Story, wouldn't know that when they say an innocent line such as "enjoy it now, before you know it, they will be 18 and out of the house". I wonder if that will actually be the case?! When looking at others situations I think we all find ourselves wondering "what it would be like if..." I think it is one of those natural human things. Today I saw a lot of kids spending the day with their fathers, but there were kids with no dads and I wondered what might have happened. While I went to the jewelers there were two men working, and I wondered if they had children and if it was okay to say happy Father's Day. I didn't say it because I wasn't sure if maybe they lost their children or never had, and I didn't want to cause them more pain than they might already be experiencing. While I have plenty to wonder about in regards to Sonya, today I am extremely thankful that I don't have to wonder what it must be like to celebrate a Father's Day with my kids sans their father or celebrate Father's Day without my dad. My heart hurts for those of you who have to do any of those things listed above. I wonder how you made it through the day today, on top of every other day. For those of us lucky enough to have our fathers with us, be sure to give them an extra amount of appreciation. For those who have unfortunately lost their fathers, I pray that today you spent the day reminiscing over fond memories and that you have found the strength to make it through. Today is June 17, 2015. It is a Wednesday. In Arizona it is somewhere in the 100s. It is 5 days before the official start of summer and 2 days into monsoon season. It is just another day in June. Today Sonya's oldest sister will go to dance camp; hopefully she will spend her day laughing, smiling, and dancing to her hearts content. Sonya's brother will be at gymnastic camp; probably missing his sisters and hungry, but still managing to have a good time. Sonya's other sister is most likely going to spend her morning jumping around the house with her brown pigtails and pating Sonya while saying "zoa ahva". Sonya's dad will be working, and me...once the day gets going I will spend it driving around town in the rented Tahoe dropping kids off and picking them up from activities. You see today is just another Wednesday in June. 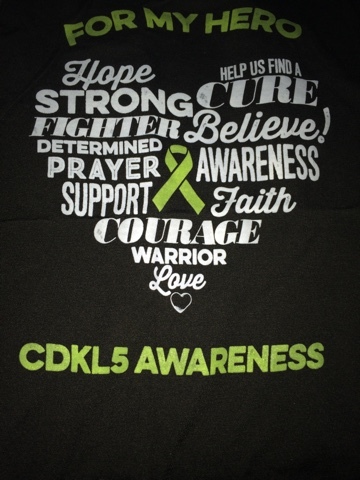 Except this year, today, June 17, will be the first of many June 17s that our family will spend the day wearing shirts with the words "CDKL5 awareness". We will start a tradition of green and purple balloons tied to a yard sign in the front yard for the neighborhood to see. We will spend the day thinking just a little bit more about CDKL5, (like that is possible) and we will think about all the children and families that have become part of our family due to a string of five characters. Today we will be a bit more outspoken about CDKL5 and we will hope someone who has never heard of it will go to their computer, type the characters in and learn a piece of information about a rare genetic mutation they didn't even know existed yesterday. Today all over the world events will occur to help raise money to continue research to hopefully one day find a cure for CDKL5. Today all over the world families will be trying to bring awareness to CDKL5. When Sonya was first diagnosed with CDKL5 among the thoughts that entered into my head was instant worry that Sonya would not really be an active participant in life. That she would not be aware, not respond, not know she was even alive. The thought suffocated me. I cried thinking she wouldn't know who I was. I cried for myself that we would go through the day to day motions of life and that would be the extent of it...just mundane motions. I remember hearing from other mothers who's children have a CDKL5 mutation, that I should not give up on Sonya, that she was there, inside, and aware. They shared stories of what their children did to demonstrate they really were cognitively "with it". It was very reassuring and I have to admit it was pretty much the only thing that took me out of my funk. I set a goal for Sonya, for myself rather...that I had to figure out how to find a way for Sonya to show us herself. Every day Sonya works so hard with improving her physical capabilities. She kicks her feet and tries to bear weight on her arms. She lifts her head up high or at least attempts to. You can actually see her giving it her all. My favorite part of watching her work is her reaction to being cheered on. She gets so proud of herself when the cheering gets louder. She rests her head and cries when she is exhausted. She lets us know her feelings. What I have also learned about miss Sonya is that she knows all too well who is working with her. She has figured out how to play the system. 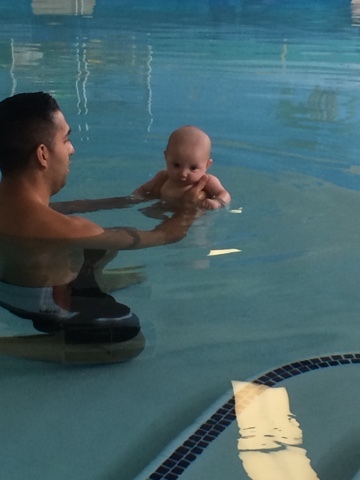 Today Sonya had her aquatic PT with Mr. Mike. Mr. Mike is awesome, he adores Sonya, he makes her work hard, but Sonya has figured him out. Mr. Mike may look like a tough guy, but he does not like to make baby Sonya cry. Sonya knows if she as so much whimpers Mr. Mike is going to change her position. She will totally play Mr. Mike and it is so cute to watch. Don't get me wrong, Mr. Mike will push her and make her work little muscles to the max, but he is much softer than her ema. It is my proof that my baby girl is there! I am so glad I did not throw in the towel and give up on her before I even gave her a chance. I am so glad to see Sonya "come out". We must never let the diagnosis of our children set limits. Sometimes that is easier said then done. No matter what, we must always listen to our children, because in some way, shape, or form they are always communicating. All challenges give way to a desire for a solution. We hope when we are faced with a challenge that the road is not overly bumpy. That the road will be short. That there will be no forks. That there will be a miracle ending the challenge and every person who can, will benefit from it. As I sat feeding Sonya on the couch last week I was wrecking my brain thinking about what we could do to raise awareness for CDKL5. It is a thought that enters my mind 100,000,000,000+ times a day. I have a yard sign, we printed awareness signs for all the places the kids have activities, we changed our Facebook pictures, Sonya has her own CDKL5 business cards. Still, I felt like we could do more. Sam walked out of the family room at that exact time. He said "you know, wouldn't it be great if there were like push ups for cdkl5? Like the ALS challenge? But whatever..." I replied with "Wait a second...that would be a great idea, we could do 5 push ups and tag 5 people" In 5 minutes the #cdkl5challenge was created. In 5 short minutes I had real hope we could find a cure. Imagine what this could do! We have posted our video on Twitter, on Facebook, on Sonya's website, on her Facebook page. The International foundation for CDKL5 research has posted it on their Facebook page. We know of 85 people who have been tagged in this challenge. That's 85 people we know of who are giving us hope. Giving CDKL5 hope. YOU all are giving us hope. Every day that you share Sonya's story gives us hope. Every day you share your #cdkl5challenge video, YOU give us hope. We have hope because of YOU. We are so appreciative of YOU!! Some days the only thing that gets me through is the slight chance of hope that there will be a cure for Sonya and her friends. The smile that I wear on my face due to hope is a real smile. When I feel down and sad about the things Sonya is struggling with and what we as a family struggle with because of CDKL5, I can lean on hope. We all pray that if we have to endure a challenge the outcome will be favorable. We hope we can appeal to those of you who have yet to participate in our challenge. Our ultimate goal is to try to make our journey as well as the journeys of other children with CDKL5 mutations a little more smooth. We hope the #cdkl5challenge can reach far and wide (and maybe even get to Ellen :-)). 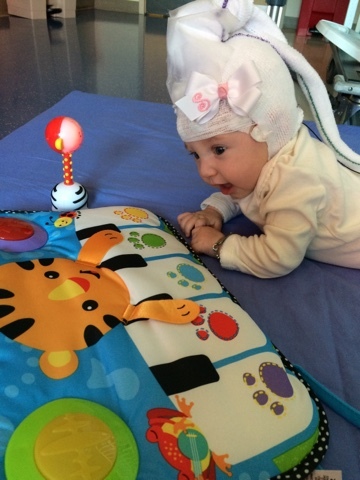 Today Sonya had a "routine" EEG (yes, similar to our oldest having a routine dance class-it's just part of the schedule) and during the 45 minutes I was holding her, thoughts sporadically entered my mind. I started to think about the fact that I was raising awareness for CDKL5. A genetic disorder I never even knew existed just 7 weeks ago. A genetic disorder that is so rare, it is known by its genetic makeup because no one has laid claim to it. A genetic disorder that is robbing me of my long anticipated perfectly healthy 4th child. Sonya was breastfeeding on and off during the testing, and when she wasn't eating she was attempting to sleep in my lap. I couldn't help but wonder, what outward characteristics would Sonya display if she did not have a mutation on her CDKL5 gene. Would she be spunky like her sassy sister, sensitive like her brother, have a contagious laugh like her oldest sister? Would she still love music, fall asleep in a swing, in her carseat on the go? Would she smile all day long and be one of those overly happy babies or more like her oldest sister who until she was beyond a year would rather give the stink eye? When you are bringing awareness, you have to be experiencing the cause. In order to educate, you have to have first hand knowledge. You have to relate to the topic in some manner to truly have a passion for your purpose. With every fiber of my being I want to know Sonya. I want to know her likes and dislikes. I want to know her favorite color and if she prefers Minnie Mouse or Elsa. I want to hear her first word. I want to beg her to go to sleep because she is reading 18 books in her bed. I want her to fight with her siblings. For all of these reasons and so many more I am begging you all to help raise awareness. HELP US FIND A CURE. Help us give ALL parents with children who suffer from a CDKL5 mutation answers to these questions and so many others we wonder on a daily basis. We are small in number. It is impossible to do this with the less than 600 members in our Facebook support group. But with each of YOU it is possible. Share Sonya's Story. Participate in the push-up challenge Sam and I started (#cdkl5challenge). Spread your knowledge of CDKL5 to everyone you know. Help us raise awareness for CDKL5. Use #cdkl5challenge on your videos!! Before July 26, 2011, Sam and I had no real life experience with a NICU. Just 18 months earlier with our first child, we delivered in a hospital that had a level 3 NICU for the "just in case" scenario. On that Tuesday night with uncertainty, we were quickly thrown into a new experience. 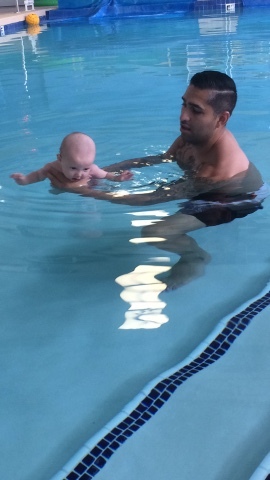 We had known throughout my pregnancy that our son had a congenital heart defect, but how severe, no one knew. Luckily for us, his stay was brief, and he was discharged back to rooming in with me in couplet care within 12 hours. His diagnosis, we would later learn was a bicuspid aortic valve with mild aortic stenosis. My knowledge of the heart has definitely grown, although I still find it a bit overwhelming with all the pieces of information we receive. Before July 26, 2011 I was unaware that a bicuspid aortic valve is the most common congenital condition of the aortic valve. Fast forward to this year. 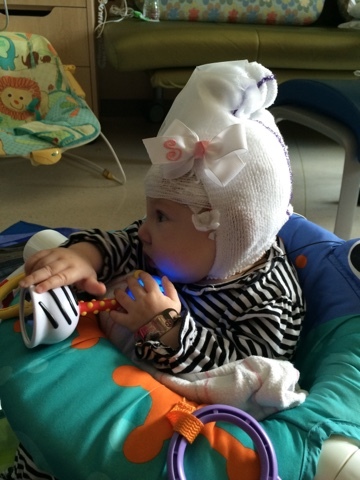 On March 11, 2015, I had no idea what a seizure looked like in a one month old. It took just 3 more days to gain that knowledge. On Thursday, April 16, 2015, at 2pm I was blissfully unaware of CDKL5 and the cause of Sonya's seizures, and then a mere 30 minutes later, I became aware. We see ribbons of awareness all the time, all around us. Some of the more "popular" ones we know without hesitation. We look at those ribbons and give pause to our own experience with the disease or person it is representing. Then there are others we look at and we are not quite sure what those stand for or who they stand for. I probably wouldn't be wrong if I said that for those less than popular ones, the majority of us don't run to the Internet to do a quick google search to learn more. We may not ever learn that the infertility awareness ribbon is pink and blue, that bright yellow is for spina bfida, or that purple is for epilepsy. It typically takes a diagnosis and deep rooted desire for a cure to want to spread information. It takes being at the very bottom of an unfortunate situation to reach out and try to garner interest. It is on the shoulders of those impacted at the first degree to teach as many people who are willing to listen so they themselves can share the information. It is our job to help raise awareness so that our ribbon color is always known. This month is CDKL5 awareness month. Our colors are purple for epilepsy and bright green for CDKL5 itself. Hope-love-cure is our motto. I ask you to join me in helping spread awareness.